Tuxedo Kitchens. Love them! The longer I do this, the easier it is to walk into a home and be able to envision exactly what the kitchen needs to bring it up to date. I can do a quick SWOT (strengths, weaknesses, opportunities, and threats) analysis in my mind and formulate a plan of action. That was definitely the case with the kitchen I’m sharing today. I walked into this home and instantly fell in love with the beautiful warm stained cabinets built all the way to the ceiling. They also had a beautiful large wood stove hood. This kitchen was dark. Too dark. Dark wood, dark floors, dark busy countertops. Since the layout was good, I knew we could lighten it up with paint, new counters and tile. A two-tiered countertop, formal old world corbels, busy granite counters and multi colored tile were a threat to the updated style my homeowner’s were seeking. The homeowners wanted to lighten things up, but I knew we could accomplish that goal and still keep the gorgeous stained wood. I started formulating a plan for a Tuxedo Kitchen. What’s a Tuxedo Kitchen? A kitchen is called a Tuxedo Kitchen when the upper cabinets and the lower cabinets are two contrasting colors. I’ve written about this trend before, but I called it a two-toned kitchen. Although the term “tuxedo kitchen” is new to me, we’ve been painting kitchens in this style for a few years. Our carpenters cut down the two-tiered countertop. We painted the upper cabinets in Benjamin Moore White Dove. The countertops were replaced with MSI Calacatta Laza. We installed these gorgeous Hicks Pendants from Visual Comfort. 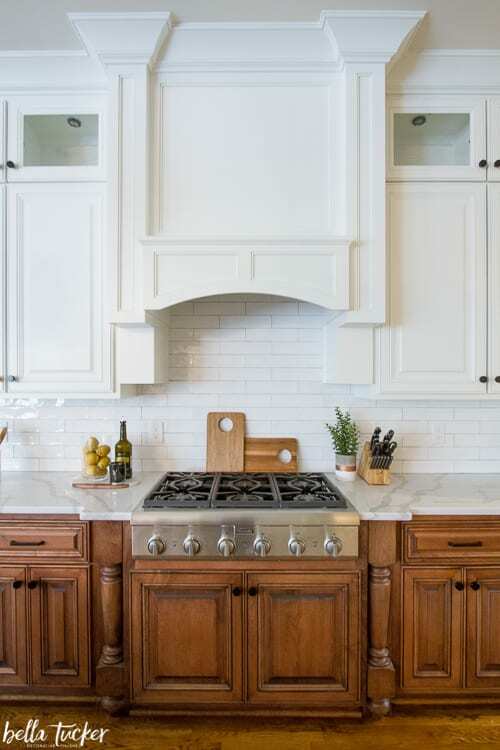 We replaced the backsplash tile with 3×12 white subway tile. I love the irregular lines which make them look handmade. We installed a new white farm sink and my very favorite- the Delta Trinsic Touch 2.o faucet. We re-worked the Butler’s pantry to add an ice machine and wine fridge. We also added wine storage over the sink. We also added these fabulous barstools from Ballard Designs. A few more after photos. Designing kitchens is my very favorite thing to do. Let me know if I can help you bring your kitchen up to date. I would love to help you fall in love with your kitchen too. Whether you are ready for a full kitchen update or just in need of cabinet refinishing, we would love to help. We do everything from custom cabinet refinishing and painting to full kitchen project management and design. Fill out the form below if you’d like more information. Final photos by Geinger Hill. Promise it will be great!